The beaches are located on the islands of Phi Phi archipelago attracts tourists with its secluded, white sand and crystal clear water. Here are some of the most beautiful beaches in Thailand. Also advantage of all the beaches of Phi Phi is a fascinating diving. 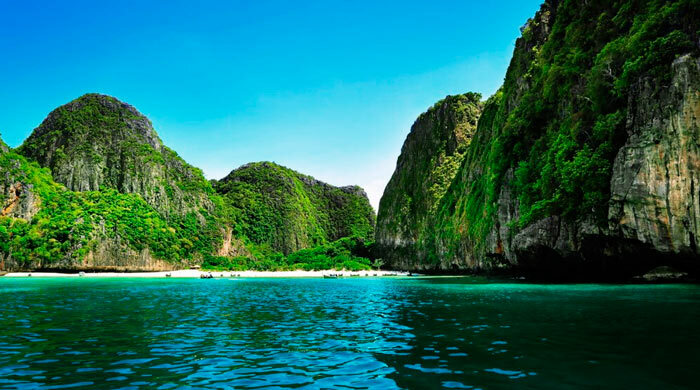 The most developed in terms of tourism is the beach on the island of Phi Phi Don. On its territory well-developed infrastructure. Relaxing holiday in hotels, many restaurants and cafes, sun beds, umbrellas and other paraphernalia available to tourists is on Phi Phi Don. On the other islands of the archipelago wild and secluded beaches with beautiful lagoons and underwater caves. Relax on one of them can be selected for the study of marine life and quiet away from the tourist bustle. A lot of tourists come to love this exotic country, which offers a diverse and unique holiday. Probably every vacationer formed his own list of the best beaches in Thailand, but if it does not have any of the above — they are sure to be added. Enjoy your holiday!